Mahmoud Asadi Shamsabadi, one of the protesters of the last presidential election, has been sentenced to two years in prison due to his presence at the grave site of the martyrs of the Green Movement. According to Kalemeh news site, 30 years old Shamsabadi was arrested on February 23, 2010 while present at the mourning ceremonies of the Green martyrs at the cemetery. He was incarcerated in Evin’s high security Ward 209 for a while before being transferred to Ward 350 in Evin prison. He was tried and convicted in a court presided by Judge Moghayeseh, and was sentenced to two years in prison. His sentence was later upheld by the Appeals Court. He was found guilty of charges of gathering and collusion with intent to act against the national security; his only crime, attending a memorial service. 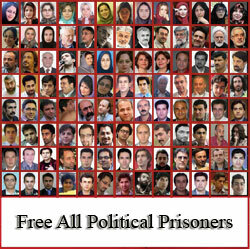 After being released on bail temporarily, he was summoned on May 23, 2011 to Evin prison for sentence implementation. Currently he is incarcerated in Ward 350 along with 180 other political prisoners. Alireza Kia, arrested on February 20, 2011 while participating in a rally to protest against the house arrest of the Green Movement’s leaders, remains in Evin prison. According to Kaleme news site, 21 years old Alireza Kia has been kept in incarceration in Evin prison Ward 350, without having been tried, for no other reason than participating in a protest rally, . He was arrested during a rally on February 20, 2011, and is facing charges of propagating against the regime, disruption of public order and gathering and collusion. Charges, against which he has not had a chance to defend himself in a court of law. This protester is currently incarcerated in Evin Ward 350 which holds most of the post-2009 presidential election political prisoners. Blogger and HR activist Housein Ronaghi Maleki was taken to Hashemi-Nejad hospital at about 11 PM last night due to deteriorating health and bleeding from his urinary track, but was returned back to Evin. According to reports from HRANA, Housein Ronaghi was taken to hospital suffering from kidney infection and bleeding but was returned back to Evin by Sepah (IRGC) interrogators. Despite insistence by the physicians that Ronaghi must be hospitalized due to deteriorating and dire heath condition, Sepah (IRGC) interrogators returned him back to Evin prison. It must be noted that Ronaghi’s interrogators refuse to approve medical furlough unless he writes a letter of repentance and accepts all of his false charges. Tehran Prosecutor has already approved medical furlough for Housein but the interrogators prevent him from being released, unless he repents and accepts all his false charges. Housein Ronaghi Maleki has been sentenced to 15 years in prison while he has denied all of his charges.